CardioWrap® Bioresorbable Sheet offers an innovative option for postsurgical healing following interventional cardiothoracic surgery. CardioWrap® is a sheet made from an amorphous bioresorbable copolymer 70:30 Poly(L-lactide-co-D,L-lactide) commonly referred to as PLA. Place the CardioWrap® Bioresorbable Sheet over a pericardial defect for use as a pericardium replacement in patients that require reoperation in 6 months. The demonstrated safety record of PLA combined with excellent handling characteristics makes CardioWrap® an excellent choice for cardiothoracic procedures. PLA has no known side effects with minimal risk of inflammatory reaction. PLA and similar resorabable materials have been used in surgical implants and suture materials for over thirty years. Virtually weightless sheet is clear and allows for complete visualization of anatomy for ease of placement. 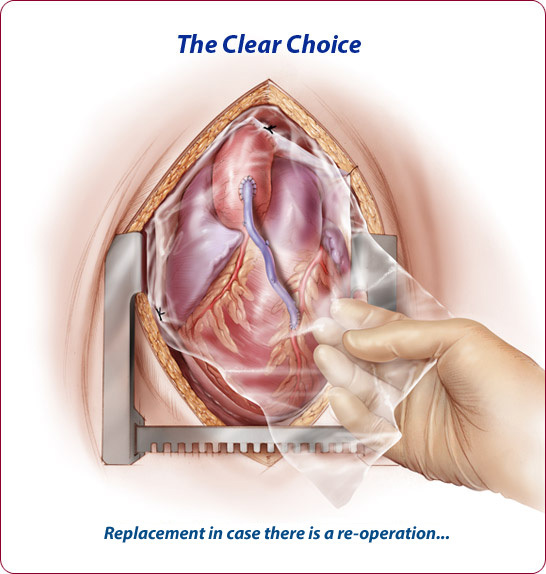 CardioWrap® is easily repositioned in wet environments, can be sutured into place for complete surgeon control, and can easily be trimmed and cut for specific anatomical considerations. Independent laboratory testing has determined that CardioWrap® is impermeable throughout the critical healing period and up to 8 weeks. The bioresorbable sheet is a synthetic match to the natural lactic acid molecule, is inert, and is naturally absorbed through bulk hydrolysis. CardioWrap® comes as a 0.05mm sheet, and retains significant tensile strength (greater than 100%) for the Initial 8 weeks and decreases in a controlled fashion through 24 weeks.